I am a person who would not cheat at solitaire if it were the Apocalypse. Even as the light lowered, I would either see the win coming or just have to take the lesson in the loss at light speed. To cheat, even if I were the last person in the world, would be – who cares? Shuffling the cards after the tidy inevitable ending, I would feel as if I cheated myself. We all know anybody can win, by pretending the eight is a seven. I’m not saying I’m holier than anybody. But I like a challenge. Now, to play solitaire at the same time as I played canasta, with a side game of Mexican Train, and to make up a set of rules I’d laid for myself in joining the three of them together – this game I could play. Even if it was a new game, and I alone held the cards and dominoes and the key to the pattern of winning. So which of these is John D’Agata doing? In a recent dust-up over fact checking, John D’Agata’s response to being confronted with his own potential misuse of facts in About a Mountain, he released a whole text of the debate he and the fact checker had over the information as its own book, The Lifespan of a Fact. I love this in-your-face rebuttal, for the same reasons I love nonfiction itself. Transparency, full-on fact-grappling truth, is fascinating, and challenging by its very nature, untidy and discomfiting; social media, the malleability of screen saves of text, twitters from the front, all thrill me in their ubiquity of personal expression, their squirrelly irrepressible human warmth, and possibilities of the possibility of even more challenging conversations. As such, I adore the meta-ness of the very premise of The Lifespan of a Fact. I love, and am induced to consider from all angles, the title itself. I even think the cover is cool, very cool. But D’Agata, no matter how eloquent the rebuttal, could be perceived as on the defensive here. Reality Hunger: A Manifesto, as many of you know, is a massive work of collage, a repurposing of the works of others into a new monstrous Frankenstein of meaning. In Reality Hunger, we saw truth strong-armed, manipulated top to bottom for the (new) author’s intention, and yet, even still, every word was true. We were forced to think about truth in its meta-narrative sense; we were pushed straight out of the narrative itself by it’s shape, and its opacity of intention. We are generally forced to read the work for its effect on us, and for its future purpose, to make us think. We are occasionally lulled by it into experiencing it as a present reading, but never do we forget it is constructed. And regardless of how any of the words were used in this massive work of collage, it was all true. Because if any word in it were found to be untrue, it’s postmodern shape has already given us the wink on that. We have already signed on for that possibility. This way, if the pieces have a narrative frisson, so be it; if they resist meaning next to each other, that’s true too. This work of making meaning from true things becomes, accrues, into Shields’ whole point. Conversely, Cheryl Strayed’s essay “The Love of My Life,” is a more linear, traditionally shaped narrative than Shields’. Here, every bit is true as well, and it certainly fulfilled D’Agata’s expressed mission statement of making a reader uncomfortable, and furthermore, in a more experimental way that’s relevant here, we were in some ways led to be confused by the story’s intention, just as D’Agata has implied serves as a higher purpose in art. Its higher purpose is muddied by sleeping around, lying, and full-out bitterness, in all their sleazy detail (If you haven’t read it, know that Strayed is meaner to herself with the details than anyone else would have been to her.). I thought about that essay for weeks, because when I closed the page where I’d read it, all I was left with as a reader was an overwhelming sense of love and loss. It was like an optical illusion, where you stare at the picture and see vases and you look away from the picture and see men’s profiles…remember this one? I felt more open, as D’Agata mandates of ideal nonfiction, “to possibilities in the world we hadn’t earlier considered.” And yet it was all true, every word, and every word’s order, and every word’s use, and context. The trick is not in the information; it is in what the recounting of her past makes us feel, on both a conscious level and an unconscious one, and the baggage we bring to the room ourselves, our inherited sense of loss, of mother’s love, of partner’s faith. The piece uses us against ourselves, and in league with the author. It is in essence a very high level sleight of hand, one which brings us to the edge of sympathy, but blindfolded. And as to D’Agata’s assertion that “it’s art’s job to trick us,” a broad assertion about which a whole other dissertation could be wrought, think please of Anne Carson’s “Foam (Essay with Rhapsody): On the Sublime in Longinus and Antonioni.“ This is a work in which one moves through the piece believing it is true, having been habituated to the form of essay now as an audience, and primed in fact by her actually calling it essay – outright lying, really – until the piece falls in on itself with little tremors of dissonance (really, you think as you read, the man did that?) until it utterly exploded into a circus of unreality. That’s a trick. That’s a trick that teaches me something about the way I read reality, not to mention the ways I physically read journals, books, and material objects by their labels and form and directed by my expectations. D’Agata’s explanation of his own tricks, in comparison, one town for another, one night for another most crucial, most memorable night of another family’s history, reads rather like a smart boy caught out. Why? Because anyone can pretend the eight card is a seven card. That’s easy. And while I often love the charisma of cheaters, after a while I don’t play with them anymore. Their stakes are simply not high enough. I tell my students, when they are tempted to do this sort of thing, that I am so much more interested in their desire for the information to line up differently, than I am in making those facts line up. I am so interested in their wish that the world be tidy, or even that information be purely informational. Beyond that, I want to know more about what bedtime story, what ingrained narrative, makes them believe that humans believe in “story” playing out a certain way. In truth, memory’s great betrayal, that it will not lie intact in wait for us, is lament enough to revisit in every generation. This is what I go to nonfiction for, the way we pick at the scab, poke our finger in the wound of memory’s fickle and existential transience, and the inconvenience of our desire to make things whole and right. I am not so interested in the prettiness of the red/black/red/black of solitaire as I am at the process of trying to marshall the cards against the odds into shape, the rush of happening to hold the cards the one time the percentages, with my full attention, can be made to go my way. If there were no odds, I would not care, or try. I’m getting pulled back into nonfiction these days partly because of the top-flight nonfiction work we’re suddenly getting at C&R Press, and partly because I’ve always been interested in it as a writer-of-verse and novelist. I’m not up-to-date on the narratives under discussion here (although I am on the issues). Anyway, these each sound like such interesting projects and approaches to nonfiction, I want to check them out. Thanks for the thoughtful analysis. This is brilliant, thoughtful and elegant. Thank you for this. What’s fascinating is how — as the exchange D’Agata + his fact checker shows and how the academic wonderings show — the human mind can compartmentalize so exquisitely. The exchange is two guys. Compartmentalizing. It reminded me of two feather-weight boxers hugging each other in the ring … and a brilliant move in and of itself to further the conversation. Aside from the debate about facts, real and true or malleable, the other assertion that “it’s art’s job to trick us” is a curious idea, if not a curious sound bite that serves as a conversation piece bought from the flea market of ideas, (perhaps the same one Duchamp ambled through). I’d be tempted to excavate his use of the word ‘job’ and ‘trick’ and ‘art’, wondering how he meant them, and how they are understood more broadly, but I’d be concerned about introducing a semiotic sensibility where perhaps one was not intended to be. You might be interested in “Trickster Makes This World: Mischief, Myth, and Art” by Lewis Hyde. ..nodding… yes, the myths surrounding the trickster archetype twigged me to wondering exactly what he meant by “trick”, and if it was a mythological definition or a modern definition. Perhaps D’Agata is functioning as a trickster or sees himself as one, crossing boundaries. I’m loath to analyse it though, of seeing/inserting/sniffing out things in that were never intended: it’s so easy to do that, and at some point just becomes a fractal argument (if I can put those two words together). Love these examples, and for the most part this feels like a wonderfully sound assessment. One thing I keep coming back to, however, is the humor essay. When “A Million Little Pieces” was the height of scandal, it was also bruited that David Sedaris, one of the few huge names in publishing, had also been widely making up his facts. But while Frey was burned in effigy, no one came after Sedaris with so much as a weak taper, and he continues to publish, and the world is better for it. The difference, it seems to me, comes down to a phrase that Sedaris used in his very first appearance on This American Life, which was a recording from one of his early live readings. “This is a story from a collection that’s coming out soon,” he begins. “People have asked me if it’s true, and I tell them it’s true enough.” Full disclosure: I’ve just fudged the quote from my best memory without looking it up, but it, like David Sedaris’s career, is true enough: The emotional and moral sense comes through, even if he’s doing a certain amount of orchestration: giving characters unusually witty dialogue, providing a somewhat absurd setup here and there. That long-ago piece was about being a gay kid at a Greek summer camp, falling in love, and finding himself forced to attack the other gay kid to avoid being found out by the other children. You could subtract a dozen details–where the camp was, what year, maybe the kids are composites, maybe the dialogue is invented from memory–before it ever stopped being true enough to move the reader or to violate her expectations. Gladwell, on the other hand, relied on a story that was all concept–I was this sort of irresponsible young journalist and I got away with it here and here and here–and so there’s no emotional truth involved; merely a sort of humble-brag posturing that’s as hollow as Frey’s absurd histrionics. It’s not so much that the facts are wrong as that Gladwell has led the reader into an emotional error—the wrong sympathies, the wrong lessons—and removing the lie leaves an ugly hole that is directly in the line of sight. Whereas if I point out that I deliberately lied earlier, and that Gladwell’s story took place not at the Times but at the Washington Post, you can feel the difference. This difference in feeling is where our trust is located. D’AGATA: No, because being more precise would be less dramatic. I wrote a memoir a few years back, and I had to change facts and alter names for legal reasons in order to hide some identities, and I had to create some composite characters to make it easier for readers to track my story. And I’ll confess that I moved an entire incident out of place so that the book could actually come to a proper dramatic climax instead of spooling out wastefully for a tedious year or so afterward the way my life actually did. The problem is that facts are both negotiable and precious, and if you massage them in one place, you have to know you pay a price elsewhere. What’s so maddening is that D’Agata seems unwilling to negotiate; he simply flings facts away without appreciating their value. That’s not postmodern; that’s a lazy failure to rewrite (or to reframe, as Fingal puts it). And that’s why his essay has cost him. I was hoping that with the cover of “About a Mountain” here that you would talk about that book, where the extract came from, because I feel like a lot of this conversation is out of context. That book is very much about the dangers of relying on facts and information, how facts, symbols, words, languages, change meaning over time, die, are ignored, abused, negotiated in the halls of congress (the half-life of the radioactive waste that would be stored in Yucca, he writes, was negotiated down to 10,000 years from the 1.5 million or something it really would be). Meanwhile, boys are jumping off of towers and we are hurtling toward our own extinction by projects like Yucca. John’s argument, I believe, is that it is art and imagination and careful looking that will save us. His book happens to be a work of art and his imagination. I think when a magazine took a piece of it and put a factchecker on it, because that’s what magazines do with “non-fiction”, things just got messy. John said from the beginning it was senseless but went along with it probably because, like most young writers in their 20s, he was dying to be published. Maybe it got a little out of control. Maybe “The Lifespan of a Fact” is clumsy and provocative. But he’s not cheating us of anything; I think he’s giving so much. The pebble thrown into the water was this notion of ‘facts’ in the context of non fiction (evidence, factual, checkable stories). But it’s connected: the issues raised — through the story and by the process of the factual(ish) story — are all part of a larger context. I don’t think it’s easy to compartmentalize. Or if it is, I am not sure the issue about facts or no facts. Writers do many things to raise readers’ consciousness and sometimes, ethical, artistic and legal boundaries get bumped. Which is not in any way to say that the points D’Agata makes with his book aren’t valid. They are. The genre thing makes it messy, doesn’t it? Submit a story that’s said to be a true one, and facts have to be checked. Not so with fiction. Or fantasy. The genre would have us believe it’s the scientific approach to writing, the formula. (hello romance novel writing). But writing for social change demands something different. Non fiction is proscribed in terms of its content needing to be verifiable; at least it has been. There have been no prescriptions for masterful, exceptional and creative writing of non fiction subject matter. If the parameters change for the genre, then it’s helpful to let readers know what the new contract is so that the relationship expectation can be set. D’Agata stated that he played around with the facts, and presumably people read and understood that. The larger question — can non fiction writers play with the facts … gets back to what distinguishes fiction from non-fiction. Traditionally, it’s been that non fiction builds, uses, shows, demonstrates the verifiable facts of real life. It’s also a genre that is steeped in the traditions of investigative journalism. In the brave new world, where the very world of publishing and writing is changing weekly, maybe it’s time for a change in what constitutes non fiction? For me, as a non fiction writer, I’m all for giving my editor facts, and telling a story as best I can with those facts. If the facts don’t fit what I think the story needs, I have the wrong facts, or the wrong angle to the story. Facts don’t change to fit the story. Where I come from, that’s not a nice thing. 😉 When I write fiction, I like to start with a fact and a truth and see where it goes. And when I blog, I mix it up ;-). But it’s not about me, it’s about the kind of writing I do, uncovering one of the many true stories hiding within the facts. You say that you’re interested in “the way we pick at the scab, poke our finger in the wound of memory’s fickle and existential transience, and the inconvenience of our desire to make things whole and right.” Isn’t that exactly what Lifespan of a Fact is doing? It’s picking at the scab, dissecting the thought process from two different places. So much of the response to this work seems to be reading it as though the whole essay is D’Agata making an argument on the page. It’s an interaction. It’s a conversation, meant to frustrating and ultimately irreconcilable. After all, we’re not discovering D’Agata as someone who fabricates. He’s putting it out there so that it can be talked about. That is the ultimate in showing the mental struggle of writing something that is meant to be both real and creative. 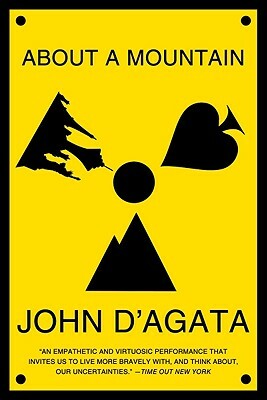 You are currently reading The World Is Not Tidy: Liz Stephens on the D’Agata Dust-Up at BREVITY's Nonfiction Blog.